In the series Moneypuck shows how the best teams maximize their GAR per dollar by finding elite talent and managing the Salary Cap. So how does the Jets roster perform when looked under the same microscope? For those that do not know, Goals Above Replacement (GAR) is a holistic number that measures a player’s total contributions by looking at their impact in things like team shot location, shot differentials, face offs, penalty differentials, and finishing talent. It is impacted by team factors and shooting percentage fluctuations but does diminish these impacts. The above data is from WAR-on-Ice. GAR/82 is player’s GAR over the last 3 seasons extrapolated to an 82 game average. Burmistrov’s GAR data is from 2010-2013. Data is for all teams over time span. The Jets have paid top dollar for their top performers. Blake Wheeler, Andrew Ladd, and Bryan Little have been their best contributors and have been compensated appropriately. Drew Stafford struggled to perform over the past three season, but the Jets hope that the change in scenery in Winnipeg and playing for a much stronger team than the Buffalo Sabres will help Stafford. The Jets best value comes from the middle of their roster, with Mark Scheifele, Adam Lowry, Alexander Burmistrov, and Mathieu Perreault performing much higher than their compensation thanks in part to ELCs and underrated skill . Chris Thorburn, Matt Halischuk, Matt Fraser, and Anthony Peluso have been slightly below replacement value players while being paid as replacement value. Now the regression line above is not the NHL market, but rather just the Jets market. Removing Drew Stafford tilts the line to rest between Ladd, Little, and Wheeler. From this we can estimate that Scheifele has been the Jets best performer, providing about 7 GAR more than the trend. Perreault then sits at about 4 GAR above, while Burmistrov and Lowry are both about 3 GAR above. For interests sake, prior to the Buffalo Sabres being a non-playoff and struggling team, Stafford averaged around a 4-5 GAR rating, or 9 GAR below what is expected given his contract. While not the best value, this is still much better than the 16 GAR below the trend line given his past 3 season performance. Also, Frolik was just over a 6 GAR player while on the Jets, which is 2 more than Stafford’s “good” estimate, or 7 below the trend line. We see a fairly similar pattern with the forwards, although with a few differences. Tobias Enstrom and Dustin Byfuglien have been the two best defenders, period. Both defenders were in the top forty in the NHL for GAR this past year and are incredibly underrated and under appreciated. 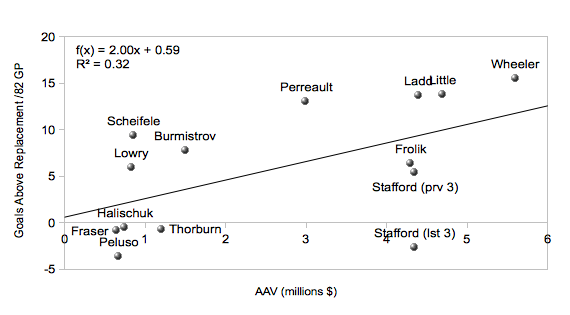 Even removing Tyler Myers from graph keeps Enstrom and Byfuglien above the trend line for Jets value per dollar. 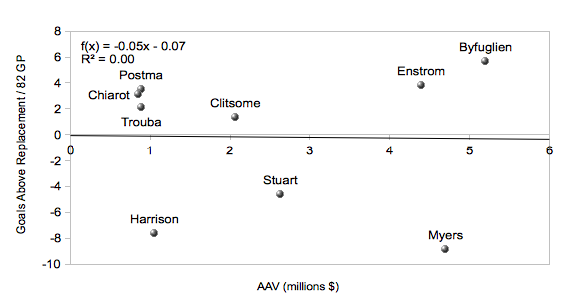 They may be one of the closest parallels in hockey to “Moneyball” where players were under valued due to their looks. The difference though to Moneyball is that it seems to be more of a fan misperception than hockey management, as both Jets coaches, the Atlanta Thrashers coaches, and management knew that these two were top performers. The Jets have some decent performing depth defenders providing solid value despite not being on entry level contracts with Grant Clitsome, Paul Postma, and Ben Chiarot. Unfortunately though, it is questionable to how Clitsome will perform when he returns from his second back surgery in two years, if he does ever return. Tyler Myers sits at a steep negative value, much like Stafford. Unlike Stafford though, Myers performed exceptionally prior the three seasons prior to the data used above. While Myers was on average a starkly negative GAR performer the last three seasons, the three prior Myers posted about a 5 GAR rating, which is similar to Byfuglien. The Jets hope to gain solid value from Myers with a return to form. It should also be noted that Zach Bogosian has been relatively worse while being on the Jets instead of the Sabres, and also holds a higher salary despite a lower AAV. Jacob Trouba has been an exceptional performer in the underlying metrics, but his total value measured by GAR has been hurt with being stapled next to Mark Stuart. The two stand outs are Mark Stuart and Jay Harrison. Both have provided far below replacement value in terms to their on-ice performance over the past three season. All the worse, Stuart has done this while playing for a strong statistical team unlike Myers and Stafford. 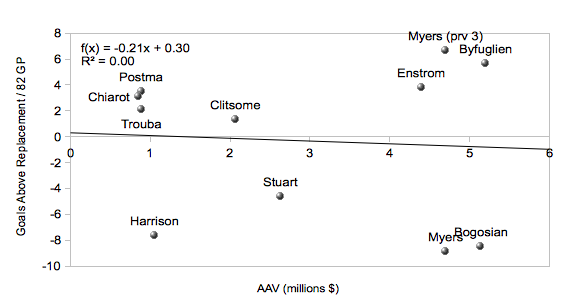 Looking at their value with removing Myers from the equation, Stuart is about 6 GAR below his expected and Harrison 7 GAR below expected from their AAV. 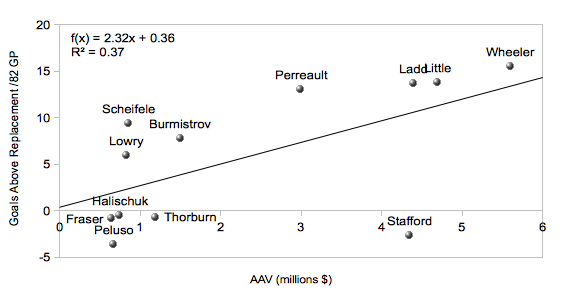 The above is only a very cursory look at how the Jets have done in getting the best value. It only looks at the Jets’ market, and not the entire NHL market. Depending on the true market, some of the above value may be slightly over or under estimated. However, the Jets have been an average-to-above-average team over the past three seasons with goaltending aside. So, we can gather that most of these trends are at least mostly true. Since we discussed the value of Bogosian and Frolik, while also mentioning that Stafford and Myers performed much better the 3 seasons prior to the last 3.